Google has enabled the functionality to share photos, documents, and other files while chatting with your friends and family in iGoogle and orkut. File transfer works directly in the browser without needing to install anything. 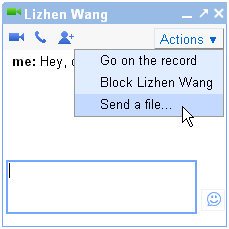 This feature is also compatible with the file transfer functionality in the Google Talk client software, so you can share files directly from the web version to the desktop version. File transfer is available in orkut and iGoogle only for now. Google promises to bring this fucntionality to Gmail soon. Google is working to bring file transfer and the new toolbar to Gmail too. In the meantime, you can continue to access voice, video and group chat in Gmail from the “Video and More” menu in a chat window.